Not to be confused with Harry Potter: The Exhibition, a traveling exhibition of items related to the Harry Potter films..
Warner Bros. Studios Tour London – The Making of Harry Potter is a public attraction in Leavesden in southeastern England. Not to be confused with The Wizarding World of Harry Potter of Universal Studios theme parks, it is a permanent exhibit offering an authentic behind the scenes glimpse of the Harry Potter films. It is situated inside Warner Bros. Studios, Leavesden in Leavesden, near Watford, in southwest Hertfordshire. Though the studios are still active, the tour is actually contained in two soundstages, J and K, and is kept separate from the rest of the complex. Warner Bros. Studios Tour London is quite possibly the only permanent filmmaking exhibit of its size in the world. It opened to the public in 2012 and since then has welcomed up to 6,000 visitors a day during peak times. TripAdvisor reported that The Making of Harry Potter has been the highest rated attraction worldwide every year since the tour opened. Leavesden Aerodrome was a British airfield created in 1940 by the de Havilland Aircraft Company & the Air Ministry in the tiny village of Leavesden, between Watford and Abbots Langley, in Hertfordshire. It was an important centre for aircraft production during World War II. By the end of the war Leavesden Airfield was, by volume, the largest factory in the world. After the war, the aerodrome was purchased outright by de Havilland, who themselves had a succession of owners in the following decades but ultimately they and the site were acquired by Rolls-Royce. However, by the early 1990s, Britain's manufacturing industry was in decline and Rolls-Royce had sold their interests in the site. Unable to find a new owner, Leavesden Aerodrome was left disused and all but abandoned. Then in 1994, the production team for the James Bond film GoldenEye discovered the unoccupied Leavesden. The wide, tall and open aircraft hangars were uniquely well suited to conversion into film stages. Eon leased the site for the duration of their shoot and went about gutting the factories, turning them into stages, workshops and offices - in short a working film studio. Leavesden Studios, as the site was rebranded by its owners, quickly became popular after GoldenEye wrapped. A succession of major feature films made use of the site, including the first of the Star Wars prequels, The Phantom Menace, and Tim Burton's Sleepy Hollow. In the year 2000, Heyday Films leased the site for the Harry Potter films. Over the next ten years all of the Harry Potter films were made there, along with some other notable Warner Bros. productions, with the series eventually becoming the most successful film series in history. As the eighth and final Harry Potter film was nearing completion, in 2010, Warner Bros. announced their intention to purchase the studio as a permanent European base. By November, Warner Bros. completed its purchase of Leavesden Studios and announced plans to invest more than £100m into the site they had occupied for over ten years, rebranding it again - this time to Warner Bros. Studios, Leavesden. As part of this redevelopment Warner Bros. also created two entirely new soundstages, J and K, to house a permanent public exhibition called Warner Bros. Studio Tour London – The Making of Harry Potter, creating 300 new jobs in the local area. Currently the whole attraction is dedicated to the making of Harry Potter and is now home to many of the series' most iconic sets, props and costumes. It was opened to the public in early 2012. As early as 2001, after the success of the first film, Warner Bros. were putting plans to build an attraction dedicated to the series in place and so began storing items from the films when they were no longer being used. Finally, in 2010, as the last film was nearing completion, Warner Bros. announced they would be purchasing Leavesden Studios and work on the tour began. The tour's layout and overall presentation was designed by the Burbank-based Thinkwell Group in close collaboration with Warner Bros, as well as the actual filmmakers, including Production Designer Stuart Craig, Set Dresser Stephenie McMillan, Creature Designer Nick Dudman, Construction Manager Paul Hayes and Special Effects Supervisor John Richardson. It only includes sets, props and costumes that were actually created for or used in the production of the Harry Potter film series. Sets include the Great Hall, Dumbledore's Office, Diagon Alley, the Ministry of Magic, Gryffindor Common Room and Boys' Dormitory, Hagrid's Hut and a 1:24 scale model of Hogwarts Castle (used for exterior shots). Warner Bros. Studio Tour London – The Making of Harry Potter opened to the public on 31 March 2012. The opening event was attended by many of the Harry Potter film series cast and crew members, including Rupert Grint, Tom Felton, Bonnie Wright, Evanna Lynch, Warwick Davis, David Thewlis, Helen McCrory, George Harris, Nick Moran, Natalia Tena, David Bradley, Alfred Enoch, Harry Melling, producers David Heyman and David Barron and directors David Yates, Alfonso Cuarón and Mike Newell. Over a year since the opening of the tour (and almost twenty years after the complex was converted from aerodrome to film studios) the site was officially opened by the Duke and Duchess of Cambridge on 26 April 2013. On their royal visit they were accompanied by the Duke's brother Prince Harry and Harry Potter author J. K. Rowling (who had been unable to attend the tour's grand opening the year before) amongst other illustrious guests. Several hundred beneficiaries of charities they all support were given exclusive invitations to the Studio Tour on the day of the royal visit. The royal entourage visited both the tour, meeting many of their beneficiaries, as well as the studios, where they saw some of the props and costumes from Christopher Nolan's The Dark Knight trilogy, before conducting Leavesden's royal inauguration. Each tour session typically last three hours, and the tour has the capacity to handle 6,000 visitors daily. Despite Warner Bros. being the studio behind Harry Potter, the tour is not styled as a theme park due to the fact that Warner Bros. sold the license to do so to Universal Studios. Instead, visitors get a chance to see up close the detail and effort that goes into a major feature film at the scale of the Harry Potter series. Though the standard tour is self guided, allowing visitors to enjoy the tour at their own preferred pace, various guided tours are available at an additional cost. Visitors with some disabilities may find, however, that certain guided tours are available to them at no extra cost if they contact the tour in advance. Diagon Alley is available to explore virtually on Google Maps Street View. Warner Bros. has continued to put on special features for the school holidays, such as Dark Arts and Animal Actors, at no extra cost to visitors. Some installations like the Wand Choreography Interactive and the inside of the No. 4 Privet Drive Exterior set have been so popular that they have remained after their respective features have closed. In January 2015, the attraction's first expansion was announced - a brand new Platform 9¾ section, where visitors are able to board the original carriages behind the Hogwarts Express steam engine used in the films. As with the rest of the attraction, the set was constructed and dressed by the original crew members who worked on the film - including Stuart Craig himself, who designed the new set exclusively for the tour (since these scenes in the films were actually shot on location in Kings Cross). The setup includes the locomotive GWR 4900 Class 5972 Olton Hall (dressed as 5972 Hogwarts Castle) and the British Rail Mark 1 carriage that appeared in the films, brought to life by John Richardson's special effects team. Finally a new green screen experience illustrates what working on the films is like from an actor's point of view. This section opened in late March 2015. Following the death of Alan Rickman in January 2016 who played the role of Professor Severus Snape, visitors and fans commemorated him and set up a shrine upon the Platform. The tour was warmly received by the press in the run up to its launch. 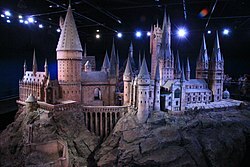 Anita Singh of The Daily Telegraph described the model of Hogwarts Castle as "the highlight" of the tour. Though Liz Thomas, of the Daily Mail, was critical of the tour's cost, describing it as "a somewhat less magical price tag". The Studio Tour has also been presented with awards for its lighting design, including the 2013 IES Illumination Award of Merit and 2013 Lighting Design Award for Lighting for Leisure. In addition, the Studio Tour was named one of the Top 10 Most Innovative Entertainment Design Projects of 2012 by EntertainmentDesigner.com. ^ TripAdvisor. "The tour's TripAdvisor page". ^ Airfields of Britain Conservation Trust. "Leavesden". ^ "Leavesden Aerodrome - From Halifaxes to Hogwarts". www.allhs.org.uk. Retrieved 2016-05-03. ^ Goldsmith, Ben; O'Regan, Tom (26 September 2017). "The Film Studio: Film Production in the Global Economy". Rowman & Littlefield – via Google Books. ^ "Harry Potter and the Philosopher's Stone - Leavesden Studios". ^ Jaafar, Ali (2010-01-27). "Warner to buy Leavesden Studios". Variety. ^ Sabbagh, Dan; Sweney, Mark (9 November 2010). "Warner Bros buys Harry Potter studios in £100m boost for UK films". The Guardian. London. ^ "Warner Bros. unveils plans for Harry Potter attraction". Watford Observer. ^ "Warner Bros. Studio Tour London: The Making of Harry Potter - Thinkwell Group, Inc". ^ "Harry Potter Message Boards :: SnitchSeeker.com - Powered by vBulletin". www.snitchseeker.com. ^ "Cast & crew attend Warner Bros Studio Tour - The Making of Harry Potter grand opening - SnitchSeeker.com". www.snitchseeker.com. ^ "Duke and Duchess of Cambridge visit Harry Potter studios". BBC News. 2013-04-26. ^ "Royals enjoy a wizard time on Harry Potter studio tour". Watford Observer. ^ "Photos: Duke and Duchess at Inauguration of Warner Bros. Studios Leavesden". Denver Post. ^ a b Thomas, Liz (2012-03-14). "The magic of Harry Potter: See inside the studios where the movies were filmed (and the biggest disappearing act will be £100 for a family ticket and a wand)". London: Daily Mail. Retrieved 2012-07-25. ^ a b Sabbagh, Dan (2012-06-10). "Josh Berger on Leavesden film studios: Harry Potter's new chamber of secrets". London: The Guardian. Retrieved 2012-07-25. ^ "Warner Bros. Studio Tour London's accessibility guide to the tour". ^ WBSTL. "WBSTL's Dark Arts feature page". Archived from the original on 2016-10-07. Retrieved 2016-07-25. ^ Watford Observer. "Story covering the Animal Actors feature". ^ Warner Bros. "Warner's list of upcoming special features at the tour". ^ "Harry Potter Tour introducing Platform 9 Â¾". 26 January 2015. ^ Singh, Anita (2012-03-14). "Harry Potter studio tour: first review". London: The Daily Telegraph. Retrieved 2012-07-25. ^ Rubin, Judith (21 December 2012). "Thea Awards & TEA Summit 2013: Warner Bros. Studio Tour - The Making of Harry Potter named for 2013 Thea Award by Themed Entertainment Association". ^ "Winners - UK Customer Experience Awards UK Customer Experience Awards". ^ "Group Leisure Awards 2012 e-magazine". ^ "Lighting Design Awards 2013". ^ "The Top 10 Most Innovative Entertainment Design Projects of 2012 – Entertainment Designer". 27 December 2012. Wikimedia Commons has media related to Warner Bros. Studio Tour London (The Making of Harry Potter).